At least once in your life, a book comes along that forges an instant connection before page one is even started. Skinny was that book for me. 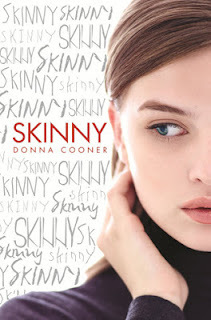 I knew, from the moment I heard Donna Cooner give her story behind Skinny, that I wanted to read it. I have always had private issues with my self image, but what drew me to this book was the concept of the little voice in the back of your head having a name: Skinny. With a Cinderella-esque format, a brilliant main character held up by brilliant supporting characters, and a little shoulder devil, Skinny was the book that, for me, could do no wrong. I say "Cinderella-esque" because it is not a retelling of Cinderella with a few shoddily hidden parallels. Cooner curves the story so that it is entirely its own creature. From the moment I started it, I couldn't put it down. I loved the main character, Ever (though I will forgive her for her name), with her edgy narrative voice that was tinged with a depth that went beyond the pages. My only issue was how I wished -- so wished! -- that she would stand up for herself more. But even when she didn't, I could deal with it, and move through the story with her without it diverting my attention. The best -- and truest -- depiction of the joys and pangs of transformation I've ever read. Deeply moving, totally addictive, utterly fabulous. I love how Skinny wasn't about preaching the warning signs of obesity or low self esteem. It was a beautiful story of a girl who transformed inside and out, so it doesn't come off as depressing or heavy. While it dealt with a very big subject and showed the not-so-friendly sides of human interactions, I didn't feel weighed down when I closed the book. I felt enlightened! It was a book that I could fully identify with, and learn from. And I loved that. Cooner's writing style was simple and elegant, and effortless morphed between scenes of skipping and laughing happiness, to edgy betrayals and bitter anger. It carried along a story that built to a climax that had me grinning like a moron in my chair. Cooner packed a thrilling conclusion within a mere few pages. It was electric. Skinny is a book that crosses boundaries. It's a book that can be read by anyone and everyone, because there isn't a person out there who doesn't feel insecure about something. Or who doesn't that that little voice of doubt niggling in the back of their mind. With its wit and universal message, Skinny is a book I'd recommend to anyone. I know what they think because she whispers their thoughts into my ear. I can hear them. Clearly. Constantly. "If I ever look like that, just kill me." It just wasn't fair. God made some people naturally skinny and some people naturally fat. I'd never know how my life would have been different if I'd been one of the ones He made skinny. I didn't know how He chose. This one will be blonde, with long thin legs and great skin. This one will be short and fat with legs that rub together when she walks. I just knew I wasn't one of the lucky ones.